China officially commissioned the lead ship in its new class of destroyers, state media reported on Friday (h/t Defense Industry Daily). The Kunming is the lead ship in China’s new Type 052D class of guided-missile destroyers (DDG). It was first launched in the summer of 2012, at which time James Holmes and Toshi Yoshihara noted on The Diplomat: “The PLAN may have found its premier surface combatant.” Defense Industry Daily notes that 6 Type 052D vessels will be launched by 2015, with 12 expected by 2018. The new DDG is the successor to China’s Type 052C DDGs. It displaces between 6,000 and 7,000 tons, and is equipped with a new 130 mm main gun. 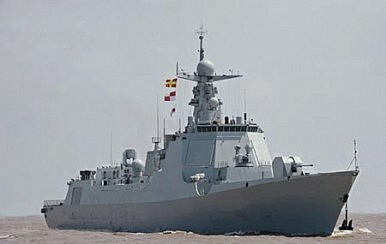 The Type 052D also boasts Active Electronically Scanned Array (AESA) radar system. It is often compared, perhaps inappropriately, to the much heavier Arleigh Burke-class DDGs and the Ticonderoga-class guided-missile cruisers. The new DDG will be available for a wide-ranging number of missions for the People’s Liberation Army Navy (PLAN). Perhaps most notably, the Type 052D could be deployed as part of a carrier battle group, or else to protect other valuable Chinese vessels like its amphibious assault ships. In doing so, they could be used to great effect as part of missions to seize islands in places like the South China Sea and East China Sea. Notably, they also could provide sea-based air defense support for a PLA contingency to storm and occupy Taiwan by force. Deploying Type 052D vessels as part of an amphibious assault group in a Taiwan invasion would further hobble Taipei’s Air Force.